MM enthusiasts have found that scanning parts drawings is an easy task and something anyone can learn to do. Plan a visit to Charles City to help with this project. Museum director Mary Ann Townsend will show you what to do. And as an added benefit, the Sleep Inn will give a special discount to those volunteers working on the Floyd County Preservation Project. Read about the project beginnings below. 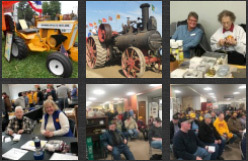 Update from Loren Book: The Minneapolis-Moline Collectors Club (MMCI) is working as an equal partner with the Hart Parr Oliver Collectors (HPOCA) to preserve information of both companies, which remained after they were bought out by White and then Agco. The two clubs have jointly purchased a quality film reader to transfer the parts drawings to computer; this will make the drawings accessible to future generations. At the Winter Convention in Clarinda, Mike Verhulst, Phillip Fett, and I handed out numerous cards with contact information for Mary Ann Townsend, the museum director. Mary Ann is overseeing the scheduling of volunteers coming to Charles City for a day, or hopefully, two or three days. The process as shown in the photos is very user-friendly and the staff can have you working in a short time. There have been 1000 cards recorded to date; we have approximately 49,000 MM cards to go. 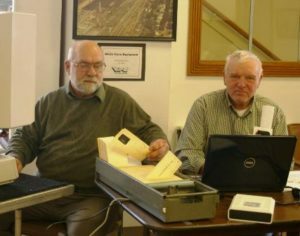 Loren Book and Arlin Wente processing some of the first cards. 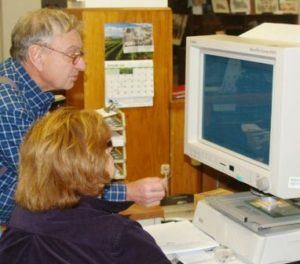 Mike Verhulst and Mary Ann Townsend looking at first aperture card processed. We are hoping to complete the process in two years. I do not want to create a contest, but I know that the MMCI membership can do more cards sooner and faster than the HPOCA! On a good day, we estimate a team of two can record 300 cards. We need lots of volunteers to process all of these cards. 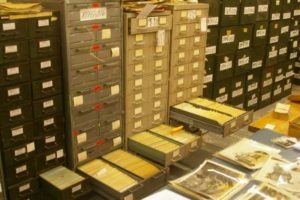 My challenge (and plea) to you would be to call Mary Ann at 641-228-1099 and schedule a time convenient for you to go to the Floyd County Museum at Charles City, Iowa to help preserve this valuable Minneapolis-Moline information.